Our contracts are written to insure the safety and well-being of our puppies - period. While we take every step possible to make our contract fair for all parties, we understand that there are special circumstances that crop up from time to time. Since there is no money exchanged (unless the puppy is being shipped in which case the adopter covers all cost of shipping) this contract is written a little differently then a buyers contract. So if you are in need of a donation pup and wish to apply please read through this contract very carefully. Nicole L. J, herein after referred to as the Seller, agrees to transfer ownership of the following puppy to __________________________, herein after referred to as the Adopter. "''" All donation puppies are donated with LIMITED REGISTRATION contracts. There are no exceptions. Since the puppy is being adopted on a limited registration contract, the Adopter is required to have the puppy spayed/neutered by 2 years of age. This puppy is donated on a non-breeding contract and as such cannot be bred while this contract is in effect. If an Adopter ignores the non-breeding agreement and permits this pup to reproduce without the sellers permission the purchaser will be deemed in violation of this agreement and all garentees are then void. The Adopter has three days (excluding weekends and holidays) from the receipt of the puppy to have it examined by a veterinarian and provide Seller with the results. If the puppy is found to be unhealthy, the Adopter may return the puppy for a full refund on shipping costs only. A signed diagnosis from the veterinarian stating that the puppy is unhealthy must be provided to be reviewed by Sellers veterinarian. No cash refunds will be given after three days. When Adopter receives the puppy, the puppy will have had at least one set of vaccinations from the 3 set series. The puppy will have been checked by a veterinarian and have been wormed if necessary. Seller warrants the hips to OFA standards. Hips and elbows are warranted to be Excellent, Good, Or Fair. This warranty expires when the puppy turns 30 months old. Donation puppies that are unable to live a normal pet life due to extreme, ongoing discomfort from a genetic condition will be replaced with a puppy of equal value. A written diagnosis by a veterinarian must be provided before a replacement puppy will be allowed. Written proof from a Veterinarian of such defect must be presented (and may be verified by the seller's Veterinarian.) Should any such defect become evident within the first 2 years after purchase the puppy will be replaced with a comparable pup at the earliest possible time. No cash refund or other compensation for expenses will be given. This pup has been inspected by the seller's Veterinarian and is certified healthy at time of donation. If Adopter has allowed the puppy to breed, then Adopter accepts the puppy to be in good health and no guarantee will be honored. Adopter is responsible for the costs associated with shipping the replacement puppy. Puppies come with a UKC registration application, a copy of each parents' three generation pedigree, a copy of each parents' OFA certificate, a copy of each parents MDR1 results, pictures of each parent, pictures of the puppy and their shot records. Buyer has the right to name the puppy, however, the name Phoenix Rising must be at the beginning of the registered name. *Adopter must provide the puppy an INDOOR environment. 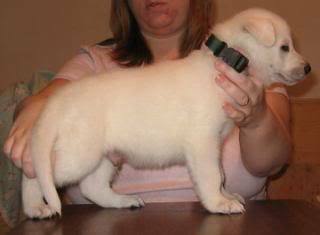 No puppies from Phoenix Rising White Swiss Shepherd Kennels may be strictly outdoor pets. *Adopter agrees to provide quality food and fresh water to the puppy daily. *Adopter agrees to exercise the puppy regularly. *Adopter agrees to provide routine veterinary care. *Adopter agrees to send a list of desired tasks the puppy will be learning to the Seller as soon as possible. This will help the Seller in selecting the right puppy for the Adopter. *Adopter agrees to provide name and contact information to a professional trainer who will be over seeing the Service Dog training of the donation puppy. *Adopter must provide information via a doctors note or a psychiatrist note or letter stating their support of Adopter aquiring a Service Dog to aid them. Contact information to said person must be included so we can verify. This is to garentee that these very important puppies go to those who truly need them. All information will be kept strictly confidental. *Adopter agrees to keep Seller updated on the donation puppies progress in Service Dog training by contacting with a report once every 3 months. *Adopter agrees to contact Seller when puppy graduates training to become a Working Service Dog. *Adopter agrees to contact Seller if puppy at any time, for any reason must be washed out of training. A breeder and trainer can do everything right and still something can arise that could cause a puppy the need to be washed out of training. This does not mean the puppy is a bad puppy. Not all dogs can ber Service Dogs as it takes a very special dog to be able to do this very special job. *Adopter agrees to provide Seller with a current address and phone number for the life of the puppy. If abuse/neglect is suspected the Seller reserves the right to order the puppy to be seen by a veterinarian. If abuse/neglect is confirmed, the Adopter relinquishes all rights to the puppy and the puppy automatically becomes the property of the Seller. The Adopter will be required to sign ownership over to the Seller immediately. The Adopter will be responsible for all veterinary fees resulting from abuse/neglect of the puppy. The Adopter will also be responsible for the costs of shipping the puppy back to the Seller. Adopter understands this is a legally binding contract. Adopter has read the contract in its entirety and understands it fully. Adopter agrees to the terms within this contract.